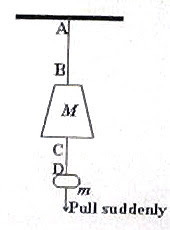 (1) A block of mass M equal to 50 kg is suspended from the ceiling by means of rope AB (fig.). Another block of mass m equal to 1 kg is suspended from the 50 kg block, by means of rope CD. 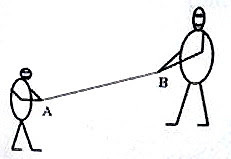 The ropes AB and CD have the same breaking strength F. If the 10 kg block is pulled suddenly with a force slightly less than F, what will happen? This question is meant for checking your understanding of the property of inertia. The rope CD will certainly break since the pulling force F and the weight mg of the smaller mass m is applied on it. Because of the large inertia of the large mass M, movement of M cannot take place immediately. Since the string CD breaks, the required breaking force is not communicated to the rope AB so that it cannot break. The correct option is (a). [If you pull the 1 kg mass slowly with a gradually increasing force, the rope AB will break. You should be able to explain this behaviour]. (2) A mother and her child (fig.) hold the ends of of a rope AB while standing at a distance of 10 m apart on a horizontal surface having negligible friction. The mother and the child have masses 70 kg and 30 kg respectively. They start pulling on the rope thereby trying to reduce the distance between them. What will be distances moved by the mother and the child if they reduce the distance between them by 5 m? The forces exerted by the mother and the child will be equal and opposite in accordance with Newton’s third law so that the rate of change of momentum (∆p/∆t) of the mother and the child will be equal and opposite. Since they reduce the distance in the same time ∆t, the change of momentum will be equal and opposite. 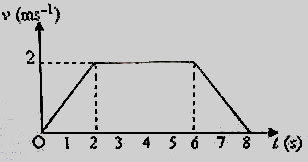 If the distance moved my the mother is x, the distance moved by the child is 5 – x. 70×x/∆t = 30×(5 – x)/∆t, from which x = 1.5 m.
The distance moved by the child is 5 – 1.5 = 3.5 m.
T2 = Total mass moved × common acceleration = (4+3)×2 = 14 N.
(4) A lift of mass 200 kg starts moving down from rest. The variation of its velocity for 8 seconds is shown in the adjoining velocity–time graph. What is the tension in the supporting wire during the 7th second? You should note that the lift is moving down and decelerating during the interval from 6 s to 8 s. The weight of the lift in this condition is m[g-(-a)] =m(g+a) where m is the mass of the lift, a is the acceleration of the lift and g is the acceleration due to gravity. (See the post dated 24th September 2008). From the graph, a = 2/(8 – 6) = 1 ms–2. This is the tension in the wire supporting the lift. We will discuss more questions in this section in the next post.